Will the stimulus save 7 extension stop? The 7 line stop at 41st St. and 10th Ave. may be saved by the stimulus. Before the weekend, we learned that the national stimulus plan would finally deliver a transit hub for Fulton Street. In fact, the stimulus may save another faulty MTA Capital Construction program from a giant budgetary mistake. In the comments to that Fulton-inspired post, SAS reader Kris Datta dropped in a note about the 7 line extension. “I understand some of this stimulus money is also being used to fund the 10th Ave. station on the 7 line extension,” he writes. To recap, the 7 line extension is a city-funded project that extends the 7 line from Times Square west along 41st St. and then south along 11th Ave. to 34th St. 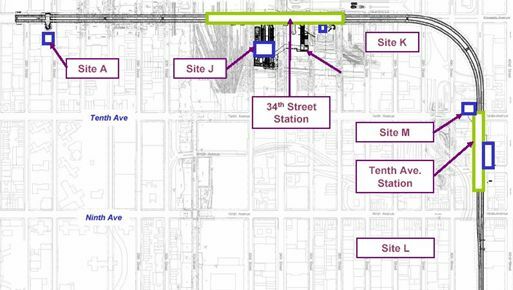 The planned development at Hudson Yards spurred on the city investment in this project, and while talks for the Yards are scheduled for Monday, it is resting on unstable ground. When the city and the MTA agreed on the extension deal, the city promised to pay for the project up to a certain point and not more. The MTA wouldn’t take on cost overruns for a project that doesn’t benefit too many people and serves simply to fatten the wallet of whatever real estate companies winds up with the Hudson Yards lands. With costs on the rise, the MTA couldn’t promise to build the station stop at 41st St. and 10th Ave., and it seemed that the city would be investing a few billion dollars in a subway extension to nowhere when other, more necessary projects — such as the LIRR East Side Access and Second Ave. Subway — tottered along. But now it sounds like the government’s infusion of cash will save another station. I’ll try to nail down a list of the MTA’s planned stimulus projects this year, but restoring this station seems to make a lot of sense. The MTA can start spending this cash on a construction project nearly immediately, and it will have long- and short-term benefits for the economy. As much as this 7 line extension isn’t a necessary plan in ways other extension proposals are, omitting a stop at 41st and 10th would have been an insult to the neighborhood. The Hell’s Kitchen area needs more transit options, and while it’s true that the area is already developed, that shouldn’t preclude subway access. In the end, though, the MTA can’t always rely on stimulus money for proper project funding. The authority has a whole bunch of plans in the works to expand and enhance subway service throughout the city, but these plans are plagued with high price tags. It’s great that the government’s efforts to kick start the economy will benefit the city, but one day soon, the state, the city and the MTA will have to find a more permanent solution to this capital funding problem. The federal government is not going to invest stimulus dollars in “upkeep,” because that’s a problem the MTA needs to solve on its own. Either we get stimulus dollars for new construction—or we do not get stimulus dollars. The 7 extension is already underway, so it seems like a pretty good place to use the money. One might argue that this project never should have been built in the first place, but that ship has already sailed. Fair point Marc – but my concern is also that the stimulus dollars wont cover the total costs of the construction, meaning the MTA will have to borrow money, and which means the debt service comes out of operations. As I see it – and pls correct me if I am wrong – these stimulus dollars can ultimately lead to operating expenses and thus to the detriment of the overall system. In this specific case, I don’t specifically know if the stimulus will lead to more debt. If it does, I agree with you that it is a poor solution. In general, the MTA needs to come up with a much better way of funding capital construction, because a lot more of it is needed. The Pataki administration chose to put it on a credit card, and we’re now stuck with the consequences. The Ravitch proposal (a new business tax and tolls on the East River bridges) is a sensible way of solving it, and we all need to hope it gets passed. Then stimulus dollars should be used to fill gaping holes, like the SAS or any number of possible extensions in unserved parts of Brooklyn or Queens. Not for speculative ventures designed to pump up the profits of developers. The Hell’s Kitchen area needs more transit options, and while it’s true that the area is already developed, that shouldn’t preclude subway access. The MTA, furthermore, needs a complete revamping, having proven themselves to be among the most impotent, corrosively corrupt entities in the country. Anyone pacing the glacial movement of the SAS can verify this…what are the costs, roughly $10,000 per foot?